"जिंदगी जब तुझको समझा, मौत फिर क्या चीज है ऐ वतन तू हीं बता, तुझसे बड़ी क्या चीज है"
"नज़ारे नज़र से ये कहने लगे,नयन से बड़ी चीज कोई नहीं तभी मेरे दिल ने ये आवाज दी, वतन से बड़ी चीज कोई नहीं "
"हिन्दी हैं हम वतन हैं, हिन्दोस्तां हमारा "
"सारे जहाँ से अच्छा, हिन्दोस्तां हमारा हम बुलबुले हैं इसकी, वो गुलसितां हमारा"
"सरफ़रोशी की तमन्ना अब हमारे दिल में है देखना है ज़ोर कितना बाज़ू-ए-क़ातिल में है"
Tujh pe marega har koyi……!!!! Dehkna Hai Zor Kitna Baajuen Qaatil Mein Hai "
Yeh meraa india , I luv my indiam, I luv my india "
" Feel the freedom, Happy Independence Day "
"Your life is full of colours. 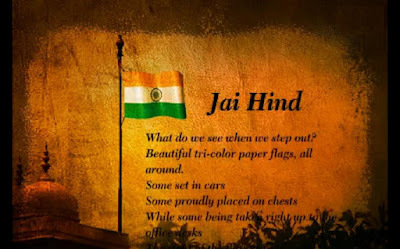 I hope this 15th August 2015 will.. add more colors to your life.Happy Independence day"
" The Sun In His Course Visit No Land More Free, More Happy, More LOVELY, than this our own country! Happy Independence Day "
" Liberty is the breath of life to nations..Happy Independence Day "
We shed many tears to get this land, now filled it with smiles and happiness." 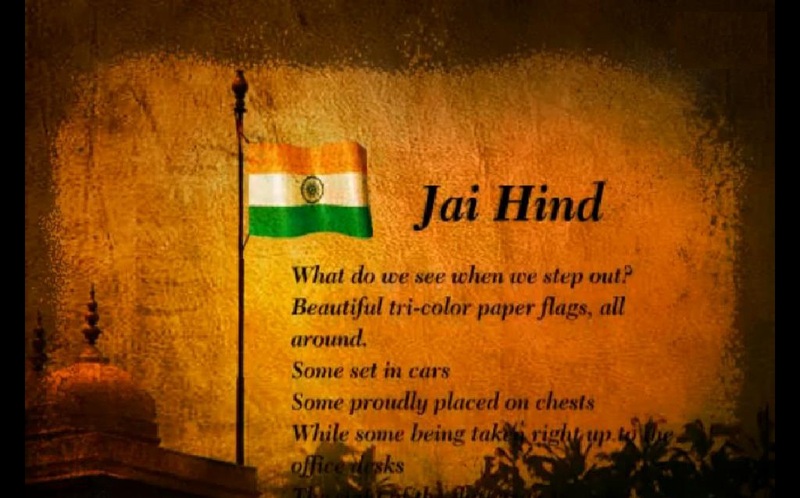 "Freedom is nothing but a chance to be better"
"Feel the pride of being the part of such a glorious nation"
"Jo log dusro ko azadi nhi dete, unhe khud b iska hk nhi hota"
"Freedom is a Precious gift of our freedom fighters"
"Be the cause of unity, Fight against corruption, Flair the flag of our nation. Happy Independence Day"
"Those who won our Independence believed liberty to be the secret of happiness and courage to be the secret of liberty"
"Honoring with you the glory and power of our free homeland. Happy Republic Day 2016"
"We have gained this land after many sacrifices, so value your land. Enjoy the day of independence"
"A nation's strength ultimately consists in what it can do on its own, and not in what it can borrow from others"
"A man's country is not a certain area of land, of mountains, rivers, and woods, but it is a principle, and patriotism is loyalty to that principle. Proud of My Country"